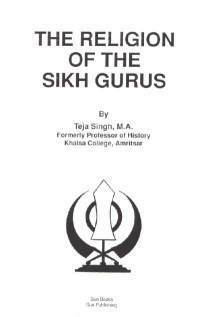 THE RELIGION OF THE SIKH GURUS by Teja Singh, M.A. Teja Singh, formerly a professor of history at Khalsa College in Amritsar, outlines the foundation of history, tradition, ritual and principles which has kept disciples of the the Sikh religion strong and united into the present day. 30 pgs. 5x8. Paperback. ISBN: 0-89540-173-8. $3.50.